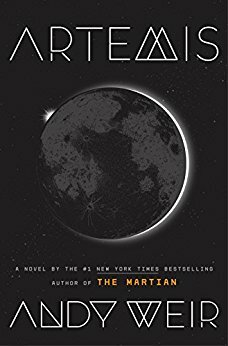 The Bottom Line: If you loved Andy Weir’s rambling, wisecracking voice in The Martian, then Artemis is exactly what you’ve been waiting for. Audiobook fans, however, may find that Rosario Dawson’s performance doesn’t quite match up to Weir’s sizzling prose as well as R.C. Bray’s did in Weir’s bestselling debut. Jasmine Bashara never signed up to be a hero. She just wanted to get rich. Not crazy, eccentric-billionaire rich, like many of the visitors to her hometown of Artemis, humanity’s first and only lunar colony. Just rich enough to move out of her coffin-sized apartment and eat something better than flavored algae. Rich enough to pay off a debt she’s owed for a long time. Trapped between competing forces, pursued by a killer and the law alike, even Jazz has to admit she’s in way over her head. She’ll have to hatch a truly spectacular scheme to have a chance at staying alive and saving her city. Jazz is no hero, but she is a very good criminal. That’ll have to do.